In this chapter we present results of our research on a collaborative platform that enables employees of a global company to present themselves, their business and company site in a company-wide autograph book. For the content generation the employees received an innovative technology, an application running on an Ultra-Mobile Personal Computer (UMPC) that enables users to generate video, sound, simple text, drawings, and photos. Main goal of this applied research is to bridge the gap between the various company sites, to foster working relationships and to strengthen the common understanding that each employee is part of a people company. This chapter describes the application, it presents an analysis of the generated content, the evaluation of the users’ acceptance of the UMPC application and the autograph book and finally an outlook on further research activities informed by these results. 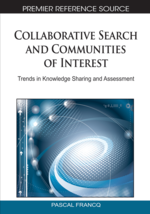 Collaboration research and development in the past decade yielded in a number collaboration and community systems. Although none of these systems matched exactly the requirement of our application we will present a brief overview on major concepts as they have provided a valuable input for the developments of the Baton application. Since about 15 years Web based applications are available that support the coordination and cooperation of distributed teams by the provision of shared workspaces, called team rooms (Roseman, 1996; Bentley 1997). Initially these systems were developed in the research area, but quickly the ideas and concepts were employed by commercial products such as Lotus Notes and later MS-Sharepoint. These systems can be described as general purpose cooperation systems that provide a configurable collaborative working environment for many different working situations. Thus, they often provide much elaborated group management and access control services, but they focus mainly on the support of distributed working situations and less in the provision of community support interfaces for multi-media information.